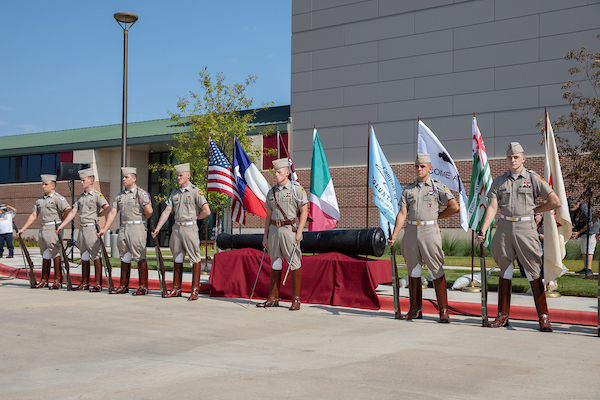 Texas A&M University’s Alamo cannon conservation project came to a historic conclusion Wednesday as the last of seven battle-used cannons were returned to the Alamo in a changing of the guard ceremony between living historians and members of the Texas A&M Corps of Cadets. During the “Texas A&M and The Alamo Present: A Salute to Alamo Cannon Conservation” event at the Texas A&M System’s RELLIS Campus, Texas A&M System Chancellor John Sharp thanked Conservation Research Laboratory (CRL) Director Donny Hamilton and Research Associate Jim Jobling and the students who worked on the project for their year of conservation work. He also recognized members of the Corps of Cadets on who participated in the changing of the guard ceremony. “I’m also proud to be part of a place that has the men and women in the Corps of Cadets, who have the same attitude that the people in the Alamo had, and that is life is not worth living without liberty,” Sharp said. Texas Land Commissioner George P. Bush, whose General Land Office manages the Alamo, called the event an “important milestone in preserving Texas history” and commended Texas A&M and the CRL for undertaking the conservation effort.